The WorldVeg West and Central Africa - Coastal & Humid Regions team recently visited Malanville, a major vegetable production area (tomato, purple onion, cabbage, chili pepper) in north Benin on the Niger border. 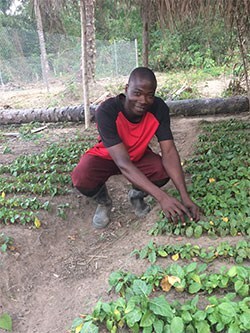 Visitors to the WorldVeg office in Benin find vegetable crops thriving in the Demonstration Garden. Partners and donors are beginning to take notice of WorldVeg West and Central Africa – Coastal & Humid Regions in Cotonou, Benin.